For other uses, see Bliss (disambiguation). Bliss is the name of the default computer wallpaper of Microsoft's Windows XP operating system. 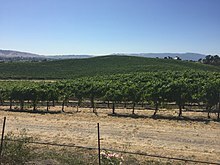 It is an unedited photograph of a green hill and blue sky with clouds in the Los Carneros American Viticultural Area of California's Wine Country. Charles O'Rear originally sent it to Corbis in 1996, and Microsoft bought the rights to the picture in 2000. Former National Geographic photographer Charles O'Rear, a resident of the nearby Napa Valley, took the photo on film with a medium-format Mamiya RZ67 camera while on his way to visit his girlfriend in 1996. While it was widely believed later that the image was digitally manipulated or even created with software such as Adobe Photoshop, O'Rear says it never was. He sold it to Corbis for use as a stock photo. Several years later, Microsoft engineers chose a digitized version of the image and licensed it from O'Rear. Over the next decade it was claimed to be the most viewed photograph in the world during that time. In January 1996 former National Geographic photographer Charles O'Rear was on his way from his home in St. Helena, California, in the Napa Valley north of San Francisco, to visit his girlfriend, Daphne Irwin (whom he later married), in the city, as he did every Friday afternoon. 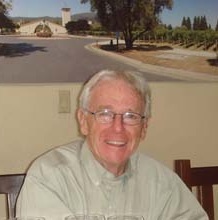 He was working with Irwin on a book about the wine country. He was particularly alert for a photo opportunity that day, since a storm had just passed over and other recent winter rains had left the area especially green. Driving along the Sonoma Highway (California State Route 12 and 121) he saw the hill, free of the vineyards that normally covered the area; they had been pulled out a few years earlier following a phylloxera infestation. "There it was! My God, the grass is perfect! It's green! The sun is out; there's some clouds," he remembered thinking. He stopped somewhere near the Napa–Sonoma county line and pulled off the road to set his Mamiya RZ67 medium-format camera on a tripod, choosing Fujifilm's Velvia, a film often used among nature photographers and known to saturate some colors. O'Rear credits that combination of camera and film for the success of the image. "It made the difference and, I think, helped the 'Bliss' photograph stand out even more," he said. "I think that if I had shot it with 35 mm, it would not have nearly the same effect." While he was setting up his camera, he said it was possible that the clouds in the picture came in. "Everything was changing so quickly at that time." He took four shots and got back into his truck. According to O'Rear, the image was not digitally enhanced or manipulated in any way. Since it was not pertinent to the wine-country book, O'Rear made it available through Corbis as a stock photo, available for use by any interested party willing to pay an appropriate licensing fee. In 2000, Microsoft's Windows XP development team contacted O'Rear through Corbis, which he believes they used instead of larger competitor Getty Images, also based in Seattle, because the former company is owned by Microsoft founder Bill Gates. "I have no idea what [they] were looking for," he recalls. "Were they looking for an image that was peaceful? Were they looking for an image that had no tension?" Microsoft said they wanted not just to license the image for use as XP's default wallpaper, but to buy all the rights to it. They offered O'Rear what he says is the second-largest payment ever made to a photographer for a single image; however, he signed a confidentiality agreement and cannot disclose the exact amount. It has been reported to be "in the low six figures." O'Rear needed to send Microsoft the original film and sign the paperwork; however, when couriers and delivery services became aware of the value of the shipment, they declined since it was higher than their insurance would cover. So the software company bought him a plane ticket to Seattle and he personally delivered it to their offices." "I had no idea where it was going to go," he said. "I don't think the engineers or anybody at Microsoft had any idea it would have the success it's had." Microsoft gave the photo its name, and made it a key part of its marketing campaign for XP. Although O'Rear had not manipulated the image in any way, the company has admitted to cropping his original image slightly to the left in order to better fit the desktop and making the greens stronger. The photographer estimates that the image has been seen on a billion computers worldwide since then, based on the number of copies of XP sold since then. Recreation by Goldin+Senneby of approximately the same location in November 2006, showing vines covering the area. Image of the hill in July 2017. In November 2006, Goldin+Senneby visited the site in Sonoma Valley where the Bliss image was taken, re-photographing the same view now full of grapevines (pictured). Their work After Microsoft was first shown in the exhibition "Paris was Yesterday" at the gallery La Vitrine in April 2007. It was later exhibited at 300m3 in Gothenburg. O'Rear concedes that despite all the other photographs he took for National Geographic, he will probably be remembered most for Bliss. "Anybody now from age 15 on for the rest of their life will remember this photograph," he said. Since the origins of the image were not widely known for several years after XP's release, there had been considerable speculation about where the landscape was. Some guesses have included locations in France, England, Switzerland, the North Otago region of New Zealand, and southeastern Washington. Dutch users believed the photograph was shot in Ireland's County Kerry since the image was named "Ireland" in the Dutch release of the software; similarly, the image was named "Alentejo" in the Portuguese version, leading users speaking that language to believe it had been taken in the eponymous region of Portugal. I didn't "create" this. I just happened to be there at the right moment and documented it. If you are Ansel Adams and you take a particular picture of Half Dome and want the light a certain way, you manipulate the light. He was famous for going into the darkroom and burning and dodging. Well, this is none of that. In 2012, David Clark of the British magazine Amateur Photographer commented on Bliss's aesthetic qualities. "Critics might argue that the image is bland and lacks a point of interest, while supporters would say that its evocation of a bright, clear day in a beautiful landscape is itself the subject," he wrote. He notes the "dreamlike quality" created by the filtered sunlight on the hillside as distinguishing the image. "What made Microsoft choose the image above all others?" he asked. Although the company had never told O'Rear or anyone else, Clark thought he could guess. "It's attractive, easy on the eye and doesn't detract from other items that might be on the screen are all contributing factors. It may also have been chosen because it's an unusually inviting image of a verdant landscape and one that promotes a sense of wellbeing in desk-bound computer users." ^ a b c Taylor, Victoria (April 12, 2014). 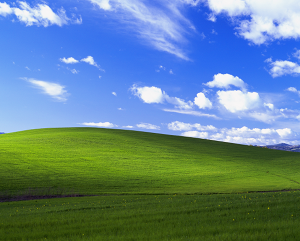 "The story behind the famous Windows XP 'Bliss' wallpaper". New York Daily News. Retrieved April 12, 2014. ^ Heisler, Yoni (July 23, 2015). "The most viewed photo in the history of the world". BGR. Retrieved July 15, 2018. ^ a b c Sweeney, Cynthia (March 26, 2014). "Say goodbye to 'Bliss'". St. Helena Star. Retrieved April 12, 2014. ^ a b The story behind the wallpaper we'll never forget (Internet video). Microsoft NL. 2014. Event occurs at 1:10. Retrieved April 17, 2014. ^ a b "After Microsoft". Goldin+Senneby. April 5, 2007. Retrieved February 15, 2010. ^ Freedman, Wayne (April 7, 2014). "Windows XP background is photo of Sonoma hillside". ABC7. Retrieved April 12, 2014. ^ a b Messieh, Nancy (August 28, 2011). "Ever wonder where the Windows XP default wallpaper came from?". thenextweb.com. Retrieved September 19, 2012. ^ Popa, Bogdan (April 11, 2014). "Microsoft Creates Short Documentary About Windows XP 'Bliss' Wallpaper". Softpedia. Retrieved April 17, 2014. ^ a b c d e Younger, Carolyn (January 18, 2010). 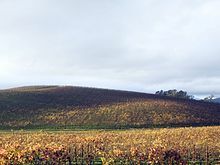 "Windows XP desktop screen is a Napa image". Napa Valley Register. Retrieved January 18, 2010. ^ Beltrone, Gabriel (April 10, 2014). "The Story of Microsoft's 'Bliss,' One of the Most Famous Photos Ever Taken". AdWeek. Retrieved April 19, 2014. ^ "Paris was Yesterday". Hanne's Art and Culture Blog. Hanne Mugaas. April 2, 2007. Archived from the original on December 1, 2011. Retrieved February 15, 2010. ^ "300m3 Art Space – History". 300m3.com. 2010. Archived from the original on June 23, 2012. Retrieved August 30, 2011. ^ Clark, David (May 28, 2012). "Bliss by Charles O'Rear-Iconic Photograph". Amateur Photographer. Retrieved April 20, 2014. Wikimedia Commons has media related to Bliss. This page was last edited on 20 April 2019, at 14:31 (UTC).